Just 15 minutes from Haines by air, you can enjoy spectacular views of Glacier Bay National Park. 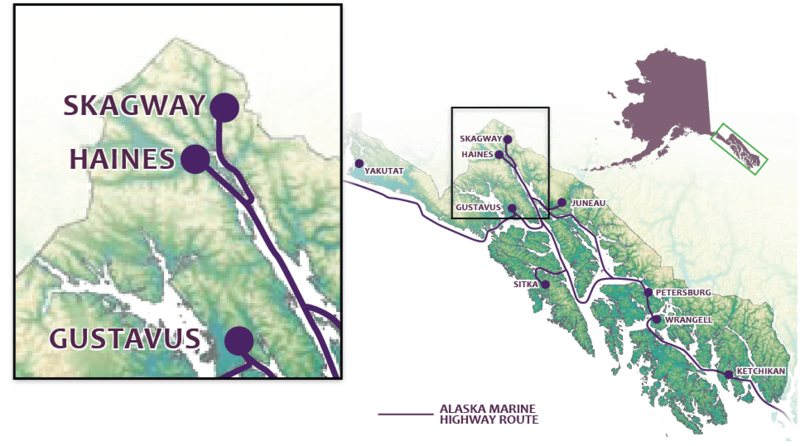 Or stay on the ground to see these ancient rivers of ice, Haines has a few glaciers of its own such as great views of the Rainbow and Davidson glaciers in Chilkat State Park, just 8 miles south of Haines. Local tour operators offer custom, up-close experiences of these and other glaciers that spill their violet-blue ice into the surrounding valleys. Warm currents in the Chilkat River cause the latest season salmon run in Alaska, which attracts the largest gathering of bald eagles in the world. Every year from October through January, the number of eagles soars to nearly 3,500 in the nearby Alaska Chilkat Bald Eagle Preserve. It is not uncommon to see dozens of eagles congregating in a tree or on a river sandbar.